The Center for New York City Law with Speaker Quinn on February 15, 2013. 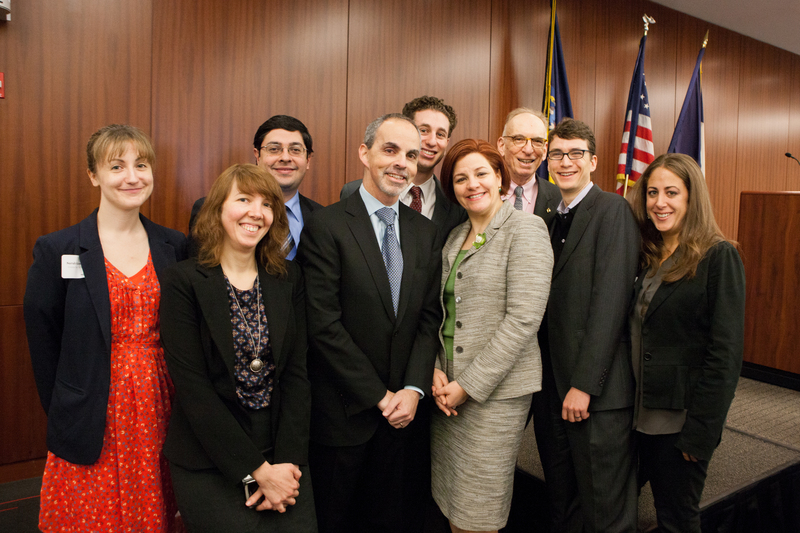 (From left to right) Sarah Knowles, Amber Gonzalez, Brian Kaszuba, Ross Moskowitz, Randy Kleinman, Christine Quinn, Ross Sandler, William Vidal, Melissa Wagner. This morning the Center for New York City Law at New York Law School hosted one of its City Law Breakfasts. The event was co-hosted by the Center for Real Estate Studies. New York Law School and the Center were honored to have City Council Speaker Christine C. Quinn as this morning’s speaker. Speaker Quinn was introduced by the Center’s founder and Director, Ross Sandler. Quinn began by thanking Ross Sandler and praising New York Law School Dean Anthony Crowell. In front of over 200 attendees, Speaker Quinn talked about a recent City Council legal victory over a proposed Department of Homeless Services (DHS) policy. That policy would make it harder for homeless single adults to access shelter. The policy was implemented without providing the Council notice and without holding a public hearing pursuant to the City Charter. The Supreme Court and the Appellate Division ruled in favor of the Council. DHS will now work with the Council to create a new policy. Speaker Quinn also focused on her State of the City Address that she gave on February 11, 2013. After her remarks, Quinn answered many questions from the audience relating to topics such as Stop & Frisk, Congestion Pricing, Police Commissioner Ray Kelly’s performance, NYC Building Codes, the MTA Transit system and Hurricane Sandy, and NYC Housing Authority issues. Click on the link below for the full video from today’s Breakfast. The Center’s next Breakfast will be held on May 3, 2013. The speaker has not yet been announced. Capital New York reported further on Quinn’s response to the congestion pricing issue.